The Great Indian Bustard Sanctuary is situated in two districts of Maharashtra which is Ahmednagar and Solapur in 8496.44 Sq. Kms. The main place is village Nanaj in North Solapur, Tehsil district Solapur. Great Indian Bustard (Choriotis nigriceps), Blackbuck (Antilope cervicapra Linn), Wolf (Canis lupus), Indian Fox (Vulpes bengalensis), Hyaena (Hyaena hyaena), Common Mungoose (Herpestes adwardsii). 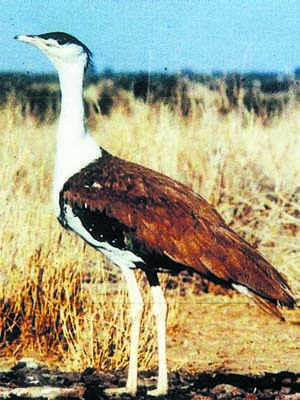 The Great Indian Bustard (Ardeotis nigriceps) is a bustard found in India and possibly Pakistan. It is a large, brown-and-white bird, the male 122 cm in length and the female 92 cm. It lives in arid and semi-arid grasslands. The current population is estimated at less than 1,000. The main threat to its existence is habitat loss. The bird is found in Rajasthan and Madhya Pradesh states of India. Ghatigaon and Karera santuaries in Madhya Pradesh had sizeable population earlier but now there is no Great Indian Bustard seen in Karera wildlife sanctuary in Shivpuri district. A small population of these birds still resides in Nanaj sanctuary near Solapur in Maharashtra.